The coiled tip of an isidid bamboo coral whip (Lepidisis caryophyllia) found growing out of a sediment substrate. Image courtesy of the NOAA Office of Ocean Exploration and Research, Gulf of Mexico 2017. Download larger version (jpg, 724 KB). The anterior end of a chemosynthetic siboglinid tubeworm, Lamellibrachia sp., protrudes from its tube. 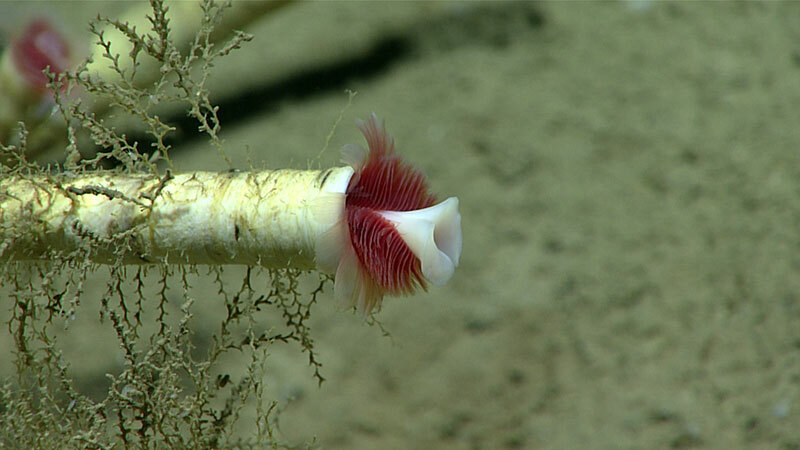 The red “feathers” are respiratory tentacles filled with hemoglobin-containing “blood.” The white structure is called an obturaculum and functions as a trapdoor that protects the opening when the worm withdraws into its tube. Brown branched hydroid colonies grow on the tube. Image courtesy of the NOAA Office of Ocean Exploration and Research, Gulf of Mexico 2017. Download larger version (jpg, 757 KB). A sea cucumber (Benthodytes sp. ) and a shrimp (Nematocarcinus sp.) happen to wander near each other. Image courtesy of the NOAA Office of Ocean Exploration and Research, Gulf of Mexico 2017. Download larger version (jpg, 849 KB). This sea cucumber, Enypniastes eximia, spends most of its time on the seafloor, feeding off of surface sediments; it can, however, swim if it wants to get somewhere more quickly or evade a predator. Common names for these holothurians include Spanish dancer and headless chicken monster. Video courtesy of the NOAA Office of Ocean Exploration and Research, Gulf of Mexico 2017. Download larger version (mp4, 39.0 MB). Today we explored “KC560,” a young mud volcano. The dive started at a depth of 2,075 meters (1.3 miles), with Deep Discoverer (D2) touching down close to a brine river with blackened reduced sediment, white bacterial mats, and a range of species, including chemosynthetic mussels (Bathymodiolus sp. ), tubeworms (Lamellibrachia sp. 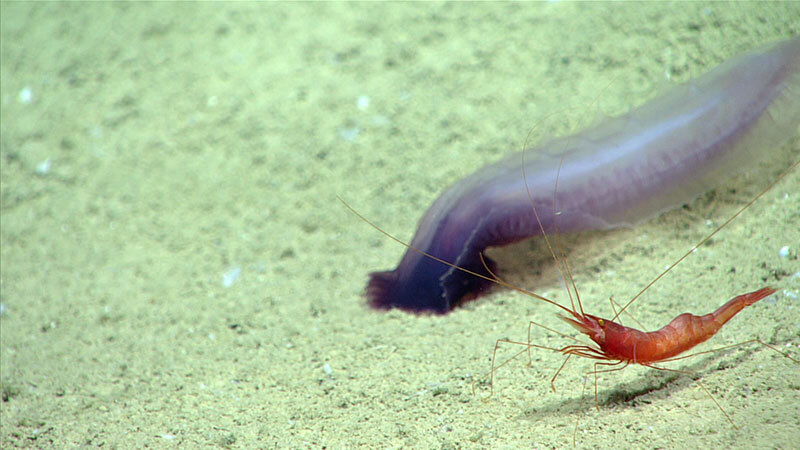 ), filter-feeding polychaete worms, shrimp, squat lobsters, anemones, amphipods, and unknown waving polychaete worms. 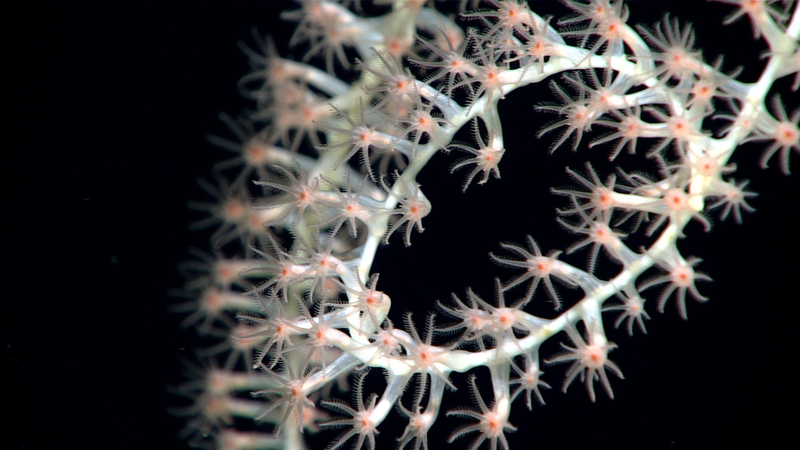 Growing on authigenic carbonates and asphalt mounds nearby were bushes of Lamellibrachia tubeworms as well as octocorals (Plexauridae sp., Isididae sp., Clavularia rudis) with commensals (brittle stars, crinoids, barnacles, and squat lobsters). Thereafter, geologically active areas were much less common, although some areas that did not appear to be chemosynthetic were inhabited by tubeworms (Siboglinum sp.). Sedimented areas were interspersed with carbonate outcrops that hosted corals and encrusting sponges. Continuing up the sedimented slopes, we observed a high diversity of holothurians and fishes. Moving up the increasingly steeper slope, carbonate outcrops hosted Paramuricea sp. and commensal ophiuroids and squat lobsters. We also saw zoanthids, glass sponges, Chaceon quinquedens red crabs, tube-dwelling anemones, and barnacles. D2 then proceeded to traverse quickly downslope to an unexplored sedimented trough and then up a second local high with more bamboo corals (Lepidisis caryophyllia).